SUNNYVALE, CA--(Marketwired - Oct 31, 2016) - Liquid Robotics®, the leader in long-duration, unmanned surface vehicles (USVs), and Boeing® have for the first time used a network of persistent USVs to detect, report and track a live submarine in a naval demonstration. Four Sensor Hosting Autonomous Remote Craft (SHARCs®) were deployed off the coast of Northern Scotland during the British Royal Navy's Unmanned Warrior 2016 demonstration. The autonomous surface vehicles used advanced Boeing acoustic sensors in the live anti-submarine warfare (ASW) mission. Over the two-week demonstration, the SHARCs successfully detected and tracked an advancing unmanned underwater vehicle and most significantly -- a manned diesel submarine. The SHARCs provided detailed and actionable intelligence to commanders through more than 100 automated contact reports, proving the USVs efficacy to autonomously conduct ASW missions and exchange data in real time. In addition to the ASW mission, two SHARCs equipped with meteorological and oceanographic sensors were deployed to the North Atlantic to gather data that ultimately contributed to sensor prediction models for Unmanned Warrior and Joint Warrior, a major bi-annual collective training exercise also hosted by the Royal Navy. The SHARCs operated 24/7 in harsh conditions unfavorable for manned operations -- waves in excess of 6.6 meters and winds of more than 60 knots -- to autonomously provide real-time data on the weather and ocean conditions critical to the safe operation of the Unmanned Warrior systems. Liquid Robotics designs and manufactures the SHARC (Sensor Hosting Autonomous Remote Craft) Wave Glider platform. 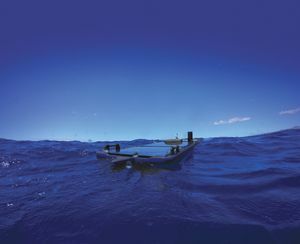 The Wave Glider and SHARC are wave and solar-powered unmanned surface vehicles. With our partners we address many of the planet's greatest challenges, by transforming how to assess, monitor, and protect the ocean. We solve critical problems for defense, commercial, and science customers. Visit http://www.liquid-robotics.com to learn more. SHARC on Duty. Photo: Liquid Robotics.